The appointment of former Aston Villa manager Brian Little as the is a "waste of money", according to Guernsey FC assistant manager Colin Fallaize. Fallaize, who also managed Guernsey to an Island Games gold medal in 2003, says someone local should have been given the role. "If Brian Little is being paid it's a waste of money," he told BBC Guernsey. Little's role with the Jersey FA is being financed by a sponsor. 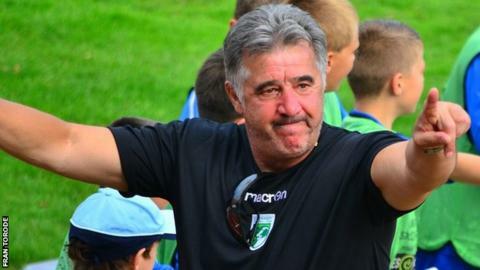 The Jersey Football Association say one of his main roles will be to use his contacts from 45 years in professional football to help organise matches for the island team, as well as create opportunities for local players and coaches in England. Fallaize continued: "They may as well just pay one of their real local lads a bit of cash to put some time into their game, who knows the game inside out. "For all the work they've done in the years before it would have been a great reward for someone of that level to get a salary." In response, Jersey FA chief executive Neville Davidson told BBC Sport: "It's easy looking from the outside in on an appointment such as Brian Little. "When you don't know the whole facts and whole agenda behind it all then it's probably not the best statement to have made." Guernsey FC are in their fourth season in the English football league system and play in the Isthmian League Division One South, the eighth tier of English football.